When I became pregnant with my second child, my one and only son was turning 2 years old. Many of my friends had already transitioned their 2 year olds out of the stroller, but I felt like the stroller was my best friend. I could strap him in, and off we would go. Trips to the mall were easy because I knew where he was at all times. I was not worried about him running through the store, so upon news of the pregnancy I began a diligent research of double strollers. My first question was: do I want a side by side stroller or tandem stroller? I had concerns about both. Would the side by side get through all doorways? Would the tandem stroller be easy to steer? But my biggest concern was: could it fit in the trunk of my small Toyota Corolla car? If it did not fit, there was no point in even considering it. With tape measure in hand, I scoured the stroller section at many, many, many baby stores. While at one I came across the Combi Twin Sport Stroller. I was immediately attracted to its great color combinations. All moms love our baby gadgets that also have style. Being almost 7 months pregnant, I went to get the stroller off of the display (about a foot off the ground) and was immediately surprised at how light it was. It was much lighter than my single Graco stroller. I could easily lift it up while being big and pregnant. The seats are a little small so I put my now 2 year old in a seat to see if he would fit. If you have a very tall child, then the stroller would not work for you, but my son is of average height so he fit perfectly. I did not have a Combi infant car seat, so I worried about clicking the car seat in to hold my infant until I spoke to my mom. We have been spoiled in our great gadgets that sometimes we forget about the old fashioned way of doing things. She told me to just lay the seat all the way down and I could lay the infant in there. Great idea mom!! And it includes an infant safety boot so that the baby has a safe little cocoon. Only drawback was that it seemed as though the straps did not tighten enough for my infant. I did feel as though she was safe though. Another drawback of this stroller is the canopy. Each side has its own canopy so that is a plus, but they are way too small and do not allow you to move them around at all. To make up for this, we purchased separate sunshades that can go over the canopies and be stretched to whatever angle you need. The stroller does not have a parent tray which was a huge disappointment, but we purchased an attachable parent cup holder to make up for this and some hooks to hang bags on. The stroller does have two pockets on the back of the seats to store stuff though. It does include cup holders for the kids though. The baskets under the seats are small compared to the ones found on a single stroller, but that is the same for all double strollers. 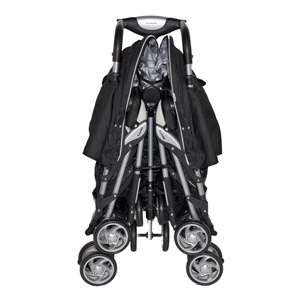 The stroller is very easy to manage and is great indoors. Its wheels are small so it was not made for a lot outdoor use. We purchased a double jogging stroller for this. It does work fine on paved concrete though. As another indoor positive: it fits through almost all doors. Many side by side strollers are difficult to get in and out of stores, but I have never had any problems getting this stroller out my front door, in store doors, in bathroom doors, and any other door we have had to travel through. Now for the absolute BEST part about the stroller: it fit into the trunk of my small car! It actually takes up less space than my single stroller did. The seats fold up and then the entire thing folds in half. It is amazing and so lightweight. I don’t mind having to get it out to use since it is so easy. Even with all of the drawbacks, I love this fact. No matter how great a stroller is will not matter if you cannot take it with you to use. I now have a Nissan Pathfinder and it easily fits in the back with the third row seats up. My single stroller won’t even fit back there. This advantage was my selling point and I absolutely LOVE this stroller. Thanks...I just noticed it. lol...I LOVE LOVE LOVE this stroller!!! 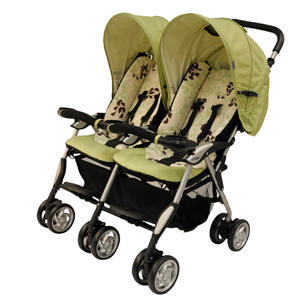 u can find twin stroller :- StrollAir is a mom owned baby stroller company. 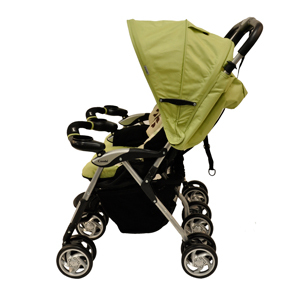 We design and offer Best Single Strollers, Twin, Double Strollers and wide range of award winning accessories. Quick update and a small giveaway! !